M T D N o v e m b e r 2 0 1 8 56 T he sales pitch over the phone was folksy yet sincere. "Uh, huh, OK, OK, listen, I hear you. I know they're pricey. But these are the Dallas Cowboys of tires, OK? And we're talking the Troy Aikman Cowboys, not that pretty boy Tony Romo! "All right, good call! You won't regret it!" George Cooper, also known as Dr. Tire in the Dallas area, had just sold another set of tires. According to his brother, Sheldon, he sells more tires than anyone in Texas. "Wow, that was impressive!" said Shel- don's friend Leonard, who heard the pitch. "It's easy when you love your product," said Dr. Tire, "and hate Tony Romo!" George, Sheldon and Leonard are fictional characters in one of the most popular situation comedies on television: e Big Bang eory. In real life, there is no Dr. Tire in Dallas. But there is in Estill, S.C. As long as one of the Bostick brothers, Joe or Robert, is in the building, the doctor is in. BRANDING DR. TIRE e Bosticks leverage the Dr. Tire name as much as possible. All the employees wear shirts with the Dr. Tire name and logo — a man wearing a white lab coat and doctor's head mirror carrying a stethoscope and tire. "is business isn't too conducive to lab coats being white!" 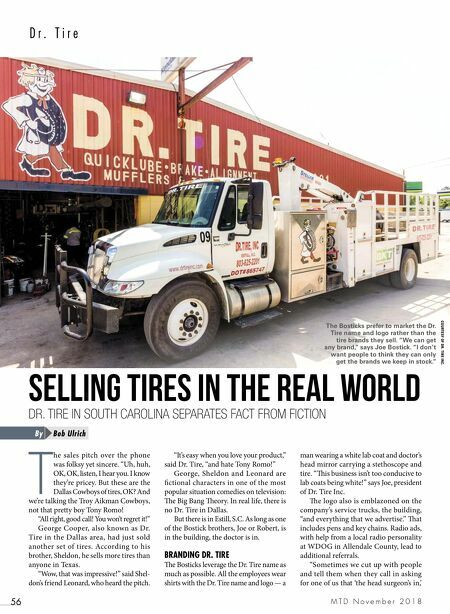 says Joe, president of Dr. Tire Inc. e logo also is emblazoned on the company's service trucks, the building, "and everything that we advertise." at includes pens and key chains. Radio ads, with help from a local radio personality at WDOG in Allendale County, lead to additional referrals. 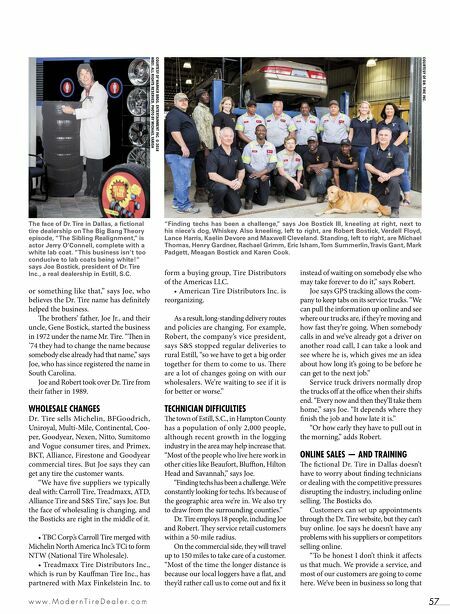 "Sometimes we cut up with people and tell them when they call in asking for one of us that 'the head surgeon's in,' Bob Ulrich By Selling tires in the real world DR. TIRE IN SOUTH CAROLINA SEPARATES FACT FROM FICTION D r . T i r e The Bosticks prefer to market the Dr. Tire name and logo rather than the tire brands they sell. "We can get any brand," says Joe Bostick. "I don't want people to think they can only get the brands we keep in stock." COURTESY OF DR. TIRE INC.